But in the real world, for a while now I’ve been nagged by this feeling of entropy in global affairs; that order and institutions are giving way to chaos and ungovernability. One word to describe global environment: #entropy. Profound transformation in relationship b/w state & man globally over last 25 years. History moves slowly, but entropy is clear as day. But the other part is acknowledging that we’re nearly 70 years into the post-World War II international system, and 25 years into the post-Cold War era. It all seems to be getting a bit long in the tooth. Now it’s impossible to explore the concept of entropy in global affairs in a comprehensive manner for a recreational blog…especially during the World Cup. But I thought it might be helpful to try to approach the issue with an analytical framework I gleaned in a lecture hall one cold evening in Italy. What follows is not the answer, but one view. Nobody knows where we’re going—especially the political risk consultants. The international system (think of the context in which states act, i.e., anarchy). Let’s start micro and telescope out to the macro. Human nature is unchanging. We know this. Greed and fear continue to motivate mankind, whether in casinos or international politics. But what do we know about the human experience? Is it getting better or worse? We’ve had a heck of a run over the last 25 years. The unprecedented integration of the global economy, with its relatively free movement of goods and capital, led to an expansion of prosperity that is unparalleled in human history (see exhibit below). It is truly astonishing. A recent Financial Times analysis relays, “In 1990 an estimated 1.9bn people, or more than a third of the world’s population, survived on less than $1.25 a day, according to the World Bank. By 2010 that figure had fallen to 1.2bn, less than a fifth of the people on earth. In the 25 years since the fall of the Berlin Wall those earning between $2 and $10 a day have been the biggest beneficiaries of globalisation.”5 The analysis went on to question whether, given reduced growth expectations for the global economy, the 40% of the world’s population that constitutes a “fragile middle” now risks descending back into poverty. 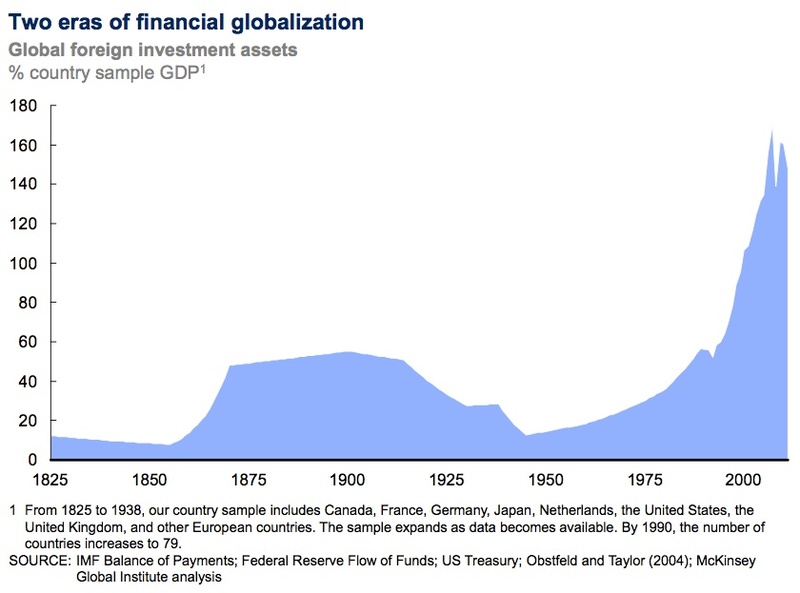 But not everyone has won from globalization. In The Reckoning, I laid out a few variables that indicated that life in the United States throughout the same period had been getting worse for many: a declining employment-population ratio, stagnant real incomes, and growing numbers of people living below the poverty line and lacking health insurance. To get another view on individuals’ conditions, I pulled some data on substance abuse and suicide in the United States; the figures add weight to the view that Americans’ living conditions are declining (see charts below; click to enlarge). These data are just for the United States, a country that confronts a number of socioeconomic and political challenges, but one that is not experiencing an acute national crisis. Or take Syria, where beyond the violence and atrocities reported in the news, 15,000 doctors are reported to have left the country after having been targeted for attack or imprisonment, with few medications and scant diagnostic equipment available for patients. In Aleppo, 36 physicians remain compared to 5,000 before the war began.8 And you thought you had trouble getting an appointment. The world witnessed this same dynamic take place roughly 20 years ago with the emergence on the global stage of Al Qaeda, and one could safely assume that a number of the Islamic State in Iraq and al Sham (ISIS) militants capturing Iraqi cities were motivated by similar conditions. To wit, last month the world learned of a 22-year-old from Florida who made his way to Syria, joined an Al Qaeda affiliate, and detonated a suicide bomb in Idlib, killing himself and 37 people…sacrificing his life on the altar of the Idea. Sticking with Iraq and Syria, there may be no better image for what’s been happening at the state-level—certainly in the Middle East—than ISIS’s bulldozing of the berm demarcating the 98-year-old border between the two countries. So much for Sykes-Picot; welcome to an environment with a smorgasbord of non-state actors and militant groups with their own ideas on how and whom to govern / kill.11 Max Weber’s definition of a sovereign state was an entity that had monopolistic control on the legitimate use of force within its own borders. Surely the entropy within a number of Arab states calls this into question. “The Middle East is always a mess,” is a common refrain, but the latest news from Iraq is genuinely terrible, and I suspect nobody has a grasp on where this all will end. I am confident making one prediction: the violence could get truly horrific. If you’re tired of reading / hearing / thinking about the Middle East, then look to Europe for additional examples. In September 2012, George Soros wrote an article calling for debt mutualization / fiscal union (i.e., Eurobonds) to solve the European debt crisis and strengthen the European Union. Here’s the opening line in his piece, which calls for states to relinquish even further sovereignty to Brussels / Frankfurt: “I have been a fervent supporter of the European Union as the embodiment of an open society—a voluntary association of equal states that surrendered part of their sovereignty for the common good.”13 While the Eurobond concept never took off, the idea was fundamentally flawed precisely because it offered a short-term, technical solution to a question whose answer is ultimately political in nature. The Euro has been saved, but not the European Union, as the notable success of populist, anti-EU parties in May’s elections demonstrated. And a number of countries’ economic challenges persist: unemployment, fragile banking systems, low growth. The historian Antony Beevor has asked, “will a continent turn its back on democracy?”15 Everyone on Earth should hope for a democratic Europe, with its countries at peace with one another. The process of greater integration that began with the European Coal and Steel Community has served its purpose so far; the question is: at this point in time, does the surrendering of state sovereignty inhibit or contribute to greater peace in Europe? Opening the aperture to the international system, one could conclude that some of the state-level dynamics undermine order and a rules-based system. The principle of state sovereignty enshrined in the Westphalian Peace of 1648 has taken a back seat of late to a variety of exigencies both real and imagined (e.g., terrorism, The Responsibility to Protect, humanitarian intervention, red lines of assorted varieties, economic crises). The flames of entropy have been fanned rather than smothered. George H.W. Bush: managed the collapse of the Soviet Union and sought a global approach toward security cooperation; was ultimately conservative / status quo in nature and tilted against revisionist policies and powers (i.e., Gulf War). Bill Clinton: took security cooperation further with a policy of democratic enlargement, whereby U.S. military force could be used both to change conditions / governance within countries, and serve as a demonstration effect for international organizations / coalitions (UN, NATO / IFOR) to participate in security cooperation (i.e., Somalia, Bosnia). George W. Bush: despite campaigning on his father’s approach to foreign policy, following 9/11 security cooperation gave way to “coalitions of the willing” and unilateral military action when deemed necessary; ardent belief in the ability of the U.S. military / government to change foreign societies; nevertheless, went through the UN for the Iraq War. Barack Obama: a confusing approach; unilateralist action via drones and special operations raids; a believer in the responsibility to protect doctrine, but inconsistent in its application; preaches of a rules-based international system but doesn’t always adhere to established rules / policies nor his commitments (i.e., red line with Syria); ineffective so far at bringing stability to the international system in the face of revisionist challenges (i.e., Russia / Ukraine). The point is that all these actions ultimately have led us to a period where the United States seeks a breather from its 25 years as the “world’s policeman” and seeks to husband its power after having changed the rules of the game. And that power may be in relative decline precisely when the global environment is becoming less benign, and rising / peer competitors (e.g., China and Russia) are becoming more aggressive toward their neighbors. The IMF has gone from the overseer of the international payment system to guarantor of global financial stability. Following the collapse of the Bretton Woods system, in the last 25 years the IMF increasingly has been tasked with putting out financial crises around the world, often compelling governments to enact unpopular, austere policies in exchange for a financing / relief package.21 And while in the early post-Cold War years, policy prescriptions tended to follow the so-called Washington Consensus with a push for capital account liberalization, the IMF recently accepted that capital controls may be warranted to reduce volatility during crises, suggesting that the international system may be getting less conducive to free capital flows. Moreover, there have been growing calls in recent years for the management of the institution to take on a non-European flavor—one perhaps more representative of the Funds’ developing country members. As for the World Bank, it no longer is the largest lender to developing countries. 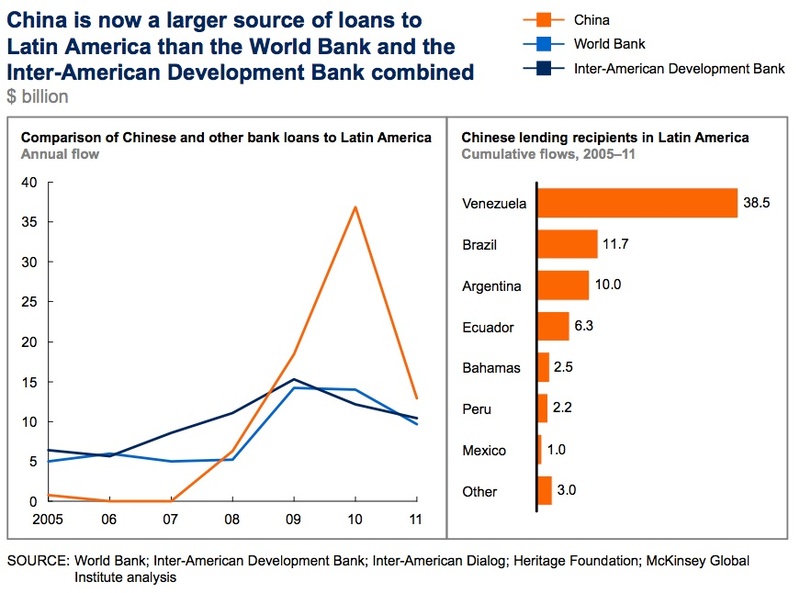 Both China Development Bank and the Brazilian Development Bank (BNDES) lend more money annually than the World Bank. China, in fact, now lends more to Latin America than the World Bank and the Inter-American Development Bank combined, according to McKinsey & Company (see exhibit). And Alan Beattie recently reported that Brazil, Russia, India, China and South Africa plan to launch a BRICS multilateral development bank next month to finance infrastructure investments in developing countries, often without the onerous conditions attendant with World Bank financing. We’ll see where all this ends up. Policymakers in emerging markets have expressed frustration at the United States’s unilateral approach toward monetary policy—Brazil’s Finance Minister, Guido Mantega, spoke of “currency wars” and the Reserve Bank of India’s Governor, Raghuram Rajan, has called for greater coordination and cooperation to avoid spillover effects—seemingly questioning the IMF’s ability to engage as an honest broker. The dominance of the World Bank in lending to developing economies is disappearing, along with the conditions for better governance, anti-corruption, etc. that came with its financing. New institutions are emerging. Maybe it’s all for the better. This post opened discussing capital markets, with asset prices across-the-board defying gravity. Maybe the market has it right. Maybe this is the best of times and things will continue to get better—at least for owners of capital and assets. Might as well have a dance party on a deck. It would not surprise me to see the capital markets carry on in The Matrix with assets continuing to push to new highs…especially when the marginal buyer is likely playing with other peoples’ money (maybe yours). I don’t know the future, but I wonder if the markets are pricing for Utopia; market participants certainly are complacent. I also wonder if tectonic change is afoot. Whether discussing man, the state, or the international system, global conditions betray a sense of entropy—of hope giving way to anger and fear, of order giving way to chaos, and all while the relative costs for changing the system that you and your parents grew up in are diminishing. Instead of compassion and cooperation, apathy, indifference and discord seem to be gaining traction. It makes me wonder if—not tomorrow, probably not next year, maybe not even in this decade—a world where people talk about asset prices will be a quaint memory. But this process will bring about calls for order, rules and a new international system, as it has for hundreds and hundreds of years. What form will the next system take? Which norms will it advance? Which polities will shape it? Nobody knows. And perhaps it doesn’t matter today. The World Cup is on, the United States advanced from the “Group of Death,” and the kind folks at AB InBev remind us that these matches are best enjoyed over ice-cold Budweiser. Where would we be without our bread and circuses? 1 E.H. Carr, The Twenty Years’ Crisis (Palgrave Macmillan: 2001), pg. 45. 2 E.H. Carr, op. cit., pgs. 87-88. 3 Dr. Pangloss in Voltaire’s Candide. 4 Walter Russell Mead, “White Water Warning: Wild Decade Ahead.” 11 January 2010. 5 Shawn Donnan, Ben Bland and John Burn-Murdoch, “A slippery ladder: 2.8bn people on the brink,” Financial Times, 13 April 2014. 6 World Health Organization, Review of social determinants and the health divide in the WHO European Region (updated 2014), pg. 112. 7 World Health Organization, op. cit. 8 Kurt Samson, “Neurologists exit Syria as hospital system nears collapse,” Neurology Today, 17 October 2013. 9 See Ted Robert Gurr’s Why Men Rebel. Synopsis here. Zbigniew Brzezinski and Brent Scowcroft talk about a “global political awakening” with David Ignatius in America and the World: Conversations on the Future of American Foreign Policy (Basic Books: 2008). 10 Barbara Tuchman, The Proud Tower (Bantam: 1967), pgs. 72-73. Truly an excellent book. Also worth a read on this topic is Joseph Conrad’s The Secret Agent. 11 Watch this FRONTLINE episode to get a sense of what’s been happening and this article for a sense of the scope of ISIS’s plans. 12 Other angles worth exploring—but not in this post—would be the role of NGOs and corporations in constraining states’ policy independence and authority. 13 George Soros, “The Tragedy of the European Union and How to Resolve It,” The New York Review of Books, 27 September 2012. 14 Perry Anderson, “The Italian Disaster,” London Review of Books, 22 May 2014. 15 I highly recommend Antony Beevor’s article, “Europe’s Long Shadow,” Prospect, 28 November 2012. 16 Robert Gilpin, War & Change in World Politics (Cambridge: 1995), pgs. 93, 95. 17 Robert O. Keohane, After Hegemony (Princeton: 1984), pg. 243. 18 Reminder: this is a recreational blog, not a submission to Foreign Affairs. 19 Michael J. Mazarr had an enjoyable piece on this topic. “The Rise and Fall of the Failed-State Paradigm: Requiem for a Decade of Distraction,” Foreign Affairs, Jan/Feb 2014. One of my former colleagues wrote this response in the May/June issue. 20 Other topics could include the status of the U.S. Dollar as the world’s reserve currency—I wrote this post on the topic five years ago—or Vladimir Putin’s op-ed in The New York Times last year. 21 Paul Blustein wrote two excellent books on this topic, The Chastening: Inside the Crisis That Rocked the Global Financial System and Humbled the IMF and And the Money Kept Rolling In (And Out): Wall Street, the IMF, and the Bankrupting of Argentina. 22 Carroll Quigley, Tragedy and Hope: A History of the World in Our Time (1966), pgs. 1310-11.